Toledo, originally known as the ‘city of three cultures’ where Christian, Muslim and Jewish communities peacefully lived together in the middle ages, Toledo is an imposing city situated above the River Tajo. This place is a real step back in time for visitors and a treasure to be explored! Mosques, synagogues and one of Spain’s best examples of a Gothic cathedral can all be found in its ancient centre. Here’s five of the best to get you started! 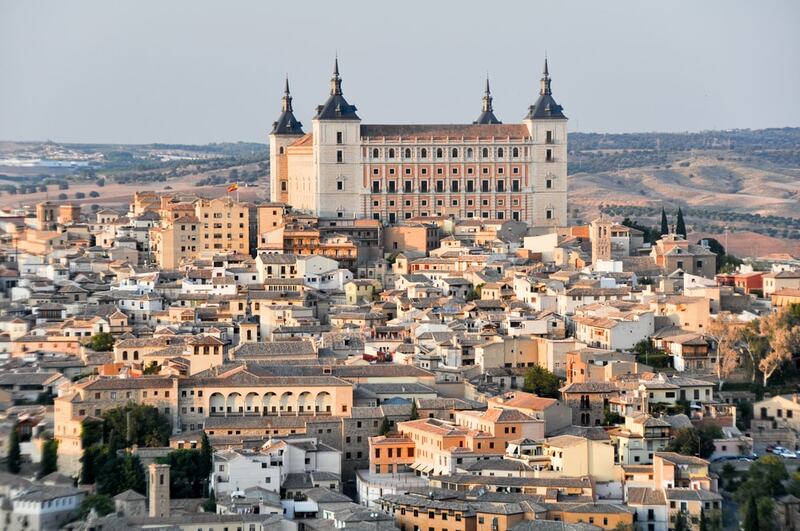 For great views the dramatic Alcazar is the place to go. Watching over the city from its highest point the fort was rebuilt under Franco but nowadays is home to a large and comprehensive military museum. Head on over to the huge historical section, which covers, in detail, Spain’s history in both Spanish and English. This museum, as well as the house itself, which is full of information and facts about the famous painter, is a must for art lovers. From the excavated cellars which formed part of a Jewish-quarter palace to the wide range of paintings, which include examples by Zurbaran, by El Greco himself and also work by his son and some of his followers. The story goes that at the start of the 20th century, a rich landowner bought El Greco’s house and spent a fortune restoring it and turning it into a museum. The problem was that El Greco never lived there! But, thankfully, the museum remains. Ok, you won’t need long to look around the underground remains of Toledo’s Roman baths but it’s well worth a quick look to get an idea of the life of Romans. However, just over the road is a fine art collection from such noted artists as, Picasso, Miro, Barcelo, Tapies, Chillida and Antonio Lopez plus a piece of artwork explaining Toledo’s history is an interesting piece too. Rated as one of the top ten cathedrals in Spain, Toledo‘s magnificent main church is a fine example of medieval Gothic architecture, and once inside you can’t fail to be impressed by the sheer size of the place! Wonderfully designed and inspiring in its way the cathedral also boasts a very good art collection where works by Goya, amongst many others, are on display. Toledo, originally known as the ‘city of three cultures’ where Christian, Muslim and Jewish communities peacefully lived together in the middle ages.